In 1878, a European explorer known as Henry Stanley authored a book called Through the Dark Continent, coining a (controversial) term for the continent of Africa in order to romantically describe the unknown and underexplored region of the world. In 2007, a PhD student from Carnegie Melon created the above visualization of Internet connection across the globe, noting that Africa -- despite being explored and well-known now -- remains ironically labelled the Dark Continent. In 2010, the Community Transformers (CT) and I set out to start a cyber café in the Mathare community, optimistically hoping to add a dot to the map and help erase the Dark Continent label once and forever. 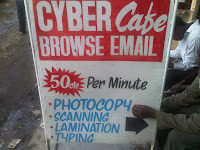 According to a recent report, only 5.5% of Kenyans own computers and 83% lack access to the Internet While the skyrocketing usage of mobile phones in the past 5 years should be celebrated -- with experts forecasting 100% penetration by 2013 -- functionality on mobile phones continues to be limited (e.g., only a small percentage have Internet, certain programs/media can't be accessed, speed is slow, typing is difficult, etc.). 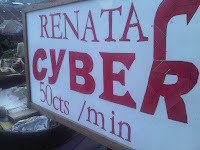 As a result, cyber cafés have become the primary location of Internet connection. In Mathare, however, the number of cyber cafés is extremely limited, specifically where CT is located. This area, known as Mathare Area 3, is a region with over 150,000 residents that is currently served by one lone cyber café (although there are 3 in the area 15 minutes away). For this reason, CT has realized the opportunity to profitably and sustainably serve this unmet need by providing a full service, high-end 15 computer cyber café. They envision that this café would also provide additional information and communication technology (ICT) services not found anywhere else in Mathare (e.g., photocopying, laminating, color printing), and will help address computer illiteracy by offering computer courses. This small and medium enterprise (SME) will be extremely important for CT as well, given that the organization is a nonprofit exclusively dependent on donor funding. Through the cyber café, CT will be meeting the needs of Mathare Area 3 -- spreading their mission of a more holistic, self reliant and healthier community -- and also generating income that can be used to support its other charity based departments (e.g., the orphan rescue center, home visits for HIV patients, youth sports, etc.). The potential is endless, and the hope is that this will be one of several SMEs that CT establishes (another being the entertainment hall, written about here). In 2015 then, our hope is that CT's Cyber will have served almost 300,000 Mathare residents, generated over $50,000 net income, and helped catalyze the elimination of the Dark Continent label, both in Mathare and throughout Africa. Note: let me know if you would like to look over a copy of the business plan -- we would love any additional input!